A year or two after in midsummer, the time when I always visited London, Howitt having returned from Australia, and being with Mary Howitt and Anna Mary, their daughter, in Normandy, I found D.G.R. was to be seen in their charming cottage on the Hampstead Road, called the Hermitage. In the garden of this cottage was a painting-room or study, covered with ivy, approached by outside wooden steps. I walked up to see him in the cool of the evening; the servant directed me up these steps, and I found myself in the romantic dusk of the apartment face to face with Rossetti and a lady whom I did not recognise, and could scarcely see. He did not introduce her; she rose to go. I made a little bow, which she did not acknowledge; and she left. 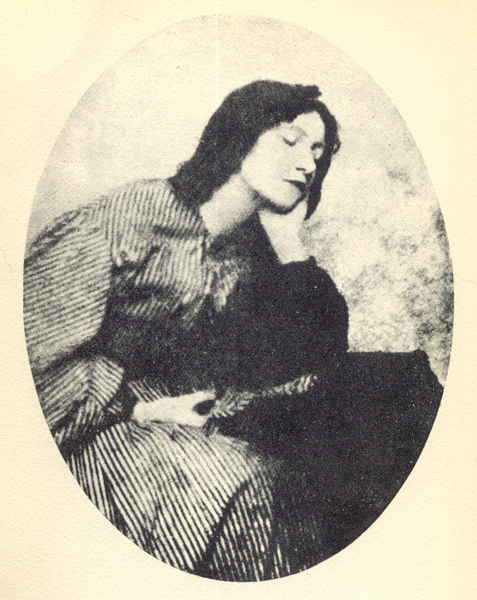 This was Miss Siddal. Why he did not introduce me to her I cannot say. Perhaps the maid should have called him instead of allowing me to invade the studio without warning; she may even done it as a lark; for myself, I had not heard yet of such a person as Miss Siddal. 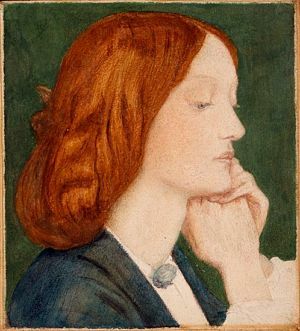 Perhaps Rossetti was already beginning to revise his intention of marriage: an even way of life the most unlikely possible suit to his late development. She began to think herself a genius too, and did small, quaint, quasi-poetical imitations of his works at that time, and then her health not being good, by Ruskin’s assistance she went to Mentone.